Star catalogues from ground-based telescopes grew in size and precision for the first half of the twentieth century, but then they hit their limit. The flickering effect caused by Earth's atmosphere prevented further improvements in astrometry until observations could be made from space. ESA's Hipparcos mission was the first space telescope devoted to measuring stellar positions. Operating from 1989 to 1993, Hipparcos allowed astronomers to map the positions and velocities of, and distances to, more than 100 000 stars with unprecedented precision. ESA's Gaia mission is astrometry for the twenty-first century, building on the legacy of Hipparcos to chart one billion stars and explore the composition, origin and evolution of our Galaxy. The 40-inch (102 cm) refractor telescope at the Yerkes Observatory in Wisconsin, USA, used by F. Schlesinger in the early 20th century. Photography and spectroscopy were game changers in astronomy in the late nineteenth century. Spectroscopy enabled astronomers to scrutinise the chemical composition of distant and otherwise inaccessible stars and nebulae, and using photography they could chart the sky with a precision and sensitivity that had not been possible before. By measuring stellar parallaxes in large photographic surveys, astronomers started to secure distances to a great number of stars close to the Sun. In 1924, Frank Schlesinger, an American astronomer and pioneer of photographic methods, published a catalogue with the positions of almost 2000 stars to a precision of about one hundredth of an arc second. With this precision, which corresponds to the diameter of the full Moon divided by 180 000, astronomers could probe stellar distances out to a few dozen light-years from Earth. Distances inferred from parallax measurements are limited in reach but are vital for calibrating indirect methods which can be used for even greater cosmic distances, albeit with less precision. These secondary distance indicators rely on the comparison between a star's observed and intrinsic luminosities, given that the intrinsic luminosity can be estimated on the basis of other observed properties of that star. One of these methods can be applied to determine the distance to stellar clusters: when astronomers compare the observed magnitude and colour of stars belonging to a cluster with predictions from stellar evolution models, they can estimate their intrinsic luminosities and, from those, the distance to the cluster. This method, which can be applied to star clusters across our Galaxy, is known as main-sequence fitting; the term main sequence refers to the core epoch in a star's lifetime, during which hydrogen is burned into helium in the stellar centre. Another method to estimate distances, which can be applied also to other galaxies beyond the Milky Way, relies on the observation of specific classes of stars and galaxies – known as standard candles – whose intrinsic luminosity can be evaluated from other properties. Cepheids - a type of variable star - are widely used as standard candles. In 1908, the American astronomer Henrietta Leavitt pioneered the study of Cepheid variability while analysing photographic surveys of the southern sky. Her results suggested that these stars could be used to measure cosmic distances because the period of their variations is directly related to their intrinsic luminosity. Before Cepheid stars could be used to estimate distances, the method needed to be calibrated by measuring the distances of a nearby sample of such stars independently. This happened in 1913, when the Danish astronomer Ejnar Hertzsprung measured the parallax of several Cepheid stars, building the first step in the cosmic distance ladder that would soon allow astronomers to chart the cosmos far beyond our local stellar neighbourhood. The ability to measure the distance to faraway sources and examine their composition led to breakthrough after breakthrough in the 1920s and 1930s. Combining these observations with the developments in theoretical physics of the time, astronomers could finally understand the physical processes that power stars, outline the shape and size of the Milky Way, and establish that the Sun is not at the centre of our Galaxy, but closer to the periphery. The distance measurements led to the extraordinary revelation that there are countless other galaxies beyond our Milky Way and that the entire Universe is expanding. The practice of modern astrophysics had begun, and triggered the development of a variety of new fields and techniques to investigate the cosmos. In this flurry of activity, the venerable practice of astrometry – the measurement of positions in the sky – only advanced very slowly. Increasing precision and sensitivity of the instruments was no longer sufficient to achieve greater precision in stellar positions. The measurements seemed to have reached their limit. The Earth's turbulent atmosphere was a huge barrier. The atmosphere degrades the quality of astronomical images collected with ground-based telescopes limiting astrometric precision. Additional noise is introduced by distortions in the telescope's structure caused by its own weight, and by the thermal response of the observatory building and telescope. The combination of these factors prevented astronomers from reaching precisions in position measurements better than one hundredth of an arc second. Telescopes on Earth are also restricted by the limited coverage of the sky each one can attain, and combining efforts from different observatories introduces other uncertainties. Hampered by these conditions, ground-based astrometry made only small progress in the twentieth century. Decades apart, American astronomers Louise Freeland Jenkins and William van Altena continued Frank Schlesinger's work and published extended versions of his catalogue. The catalogue by Jenkins was completed in the 1950s and listed about 6000 stars, while van Altena's in 1995 contained over 8000 stars. But their precision was not significantly better than that achieved by Schlesinger so many years before, limiting these surveys to a radius of a few dozen light-years around the Sun. The onset of the space age would provide solutions to all these problems and bring astrometry back to its former glory. Even before the first satellite had been successfully put into orbit in the 1950s, astronomers were considering the many advantages of observations with space-based telescopes. A space-based telescope could see more stars, and see them better. From a privileged position in orbit around Earth, space telescopes can perform observations above the turbulent layers of the atmosphere with less interference from Earth's gravity and in a thermally stable environment. All of these conditions dramatically improve the quality of images, which can also be taken readily over the entire sky. In the field of astrometry, the first to suggest a dedicated space telescope to measure stellar positions was French astronomer Pierre Lacroute in 1965. Lacroute's design had an extra feature specially intended for astrometry. His idea was rooted in the instrument used by German astronomer Friedrich Bessel to detect the first reliable stellar parallax in 1838. Bessel used a lens cut in half to perform differential measurements of the positions of the stars, enhancing his ability to identify changes in their positions. Lacroute suggested performing differential measurements on the sky, and in addition, he proposed to do so across very wide angles. To achieve this, the telescope must scan two separate fields at the same time. This observing strategy allows astronomers to establish a coherent frame of reference over the whole sky and to measure absolute parallaxes, something that was impossible from the small angles probed with ground-based observations. Absolute parallaxes are much more accurate than any measurement that could be achieved from the ground. This satellite concept was named Hipparcos – an acronym for HIgh Precision PARallax COllecting Satellite echoing the name of Hipparchus, the ancient Greek pioneer of astrometry. Lacroute's design and mission concept were developed further by a team including Danish astronomer Erik Høg, French astronomers Jean Kovalevsky and Catherine Turon, and Swedish astronomer Lennart Lindegren. The Hipparcos mission was accepted into ESA's scientific programme in 1980. The final design of the telescope included a beam-splitter that collects light from two different areas of the sky, separated by a 'basic angle' of 58 degrees. The beam-splitter directs light onto a primary mirror with a diameter of 29 cm, which focuses it onto the detector. The most sensitive light detectors available at the time were image dissector tubes, which are based on the photoelectric effect – the emission of electrons by a material after being illuminated with specific wavelengths of light. British astronomer Michael Perryman led the development of the project through satellite construction during the 1980s and acted as Project Scientist of the mission until its launch and also as Project Manager until its completion in 1997. Hipparcos was launched in 1989 and operated for over three years, with the operations coming to an end in 1993. The Hipparcos catalogue, released in 1997, contains the position, parallax and proper motion of 117 955 stars with a precision of 0.001 arc seconds, allowing astronomers to probe stellar distances extending out to more than 300 light-years. This was a huge advance on the best catalogues compiled from ground-based observations. The larger but less precise Tycho 2 catalogue contains positions and proper motions of 2.5 million stars. Published in 2000, it combines Hipparcos data with ground-based observations from older surveys. Data from Hipparcos had a profound influence on most fields in astronomy. The improved astrometric precision led to much better estimates of many parameters of stars, from their luminosities to their chemical composition. This advanced significantly the understanding of the internal structure of stars and of stellar evolution. With a robust and precise reference frame, astronomers could finally describe the dynamics of stars in the solar neighbourhood and study many stellar clusters in great detail. Beyond the Milky Way, stellar distances based on Hipparcos's parallax measurements allowed cosmologists to refine the calibration of the cosmic distance ladder, leading to a more precise estimate of the expansion rate of the Universe and of its age. The new value for the age of the Universe solved a long-standing conundrum; at last astronomers could show that the Universe was older than the oldest globular clusters in the Galaxy, which also had their ages revised based on Hipparcos data. Data from Hipparcos have also been applied to the study of exoplanets – something that could not have been foreseen at the time of the mission planning given that the first planet outside our Solar System was found only in 1995. Astronomers have used data from the Hipparcos catalogue to obtain upper limits for the masses of several exoplanets, confirming their nature, and to determine their masses and to characterise the properties of their parent stars. The application of Hipparcos data to this field pointed out that a next-generation, space-based astrometry mission with precision of 1 millionth of an arc second could bring a significant contribution to the study of planetary systems beyond our own. Hipparcos data were used to compile the Millennium Star Atlas, a three-volume publication with 1548 charts of the heavens, which was released to the public in 1997. Planetarium software as well as other visualisations of the sky, including Google Sky and the astronomy apps available for smartphones, are also based on data from the Hipparcos mission. The Hipparcos and Tycho 2 catalogues are still routinely employed as references for ground-based telescopes to find their targets, and for the navigation of space missions. Guide to our Galaxy: a virtual journey, from the centre of the Milky Way to its outskirts, showing the different components that make up our Galaxy. Credit: ESA. Click here for further details and larger versions of this video. In 2000, ESA chose to bring the tradition of astrometry into the twenty-first century by adopting Gaia, a new generation mission to chart the sky with a precision one hundred times better than that of Hipparcos. Gaia will systematically survey the sky, mapping the position, parallax and proper motion of one billion stars, probing about one per cent of the Galaxy's stellar population. With an astrometric precision of up to 0.00001 arc seconds, Gaia will determine distances to stars out to 30 000 light-years away – one hundred times farther than Hipparcos. In addition to this three-dimensional stellar map, Gaia will allow astronomers to study the velocities of stars in great detail. The velocity can be ascertained by combining the proper motion (which can be estimated from astrometric data and yields the velocity as projected on the plane of the sky) with the radial velocity, which is perpendicular to the proper motion and can be extracted from the stellar spectra collected by the spectrograph on board Gaia. With this outstanding data set, astronomers will trace the past trajectories of stars in the Milky Way, studying the dynamical history of our Galaxy. By "turning back time" in the stars' journeys, they will gain new insights into the formation of our Galaxy. Gaia's combination of astrometric, photometric and spectroscopic data will allow astronomers to characterise the surveyed stars, measuring physical parameters such as their masses and luminosities and their ages. 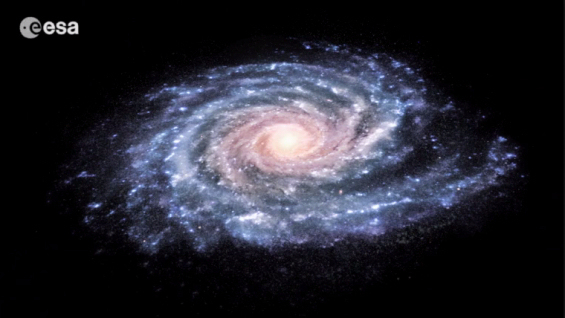 This will be an unprecedented census of the Milky Way's stellar population. Gaia draws on the heritage of Hipparcos but capitalises on the scientific progress of the past two decades. Its design comprises two telescopes to scan two fields on the sky that are separated by 106.5 degrees. Each telescope consists of six mirrors of various sizes and shapes – some of which are shared – that focus and repeatedly fold the light over a total distance of 35 m. Eventually, light reaches the detectors – an array of charge coupled devices consisting of almost one billion pixels. Gaia's cutting-edge design and custom-made detectors are key to performing the greatest ever census of the Milky Way's stellar population. Watch this space.